This inspirational deck brings the angelic insights and healing energy associated with "finding feathers" .to those who seek divine guidance from the mystical realm of birds. 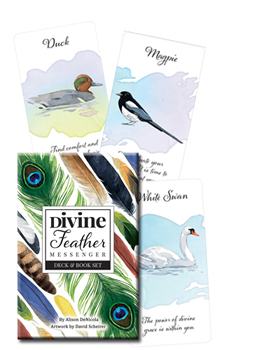 Double-sided cards present feather art on one side, with a watercolor image of the bird and an affirmational message on the reverse. The guidebook shares special stories about the 44 different birds and relates their natural symbolism to colors, seasons, elements, and special energies. Set includes 44 double-sided cards and 80-page guidebook. Card size: 2.5" x 5"